Habitat is by the people, for the people! Nearly 80% of all construction activity is completed by volunteers of all skill levels, who have helped us build, renovate, and repair over 450 homes throughout King County since our founding. As a construction volunteer, you’re in good hands, under the guidance of our awesome AmeriCorps Construction Volunteer Leads and our stellar Construction Site Managers. With you, we can keep building homes, community, and hope! Get the low down below, and for questions, check out our Volunteer FAQs. If you like volunteering, there’s a good chance we’ll click. 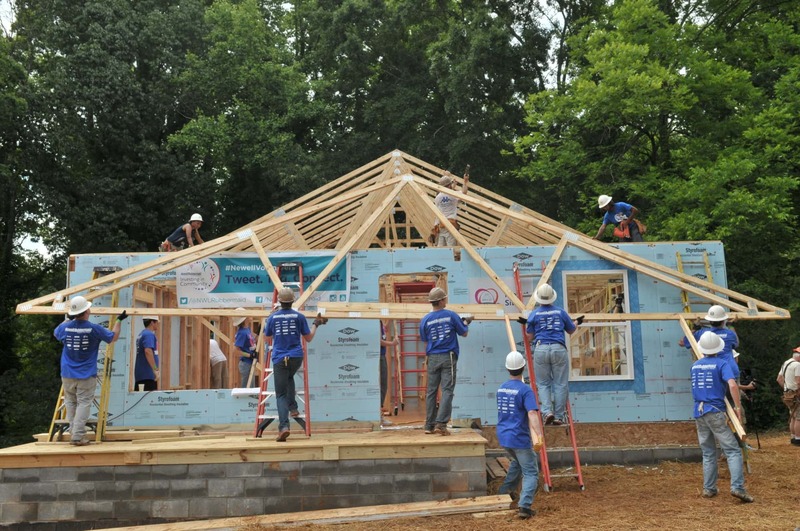 Construction volunteers help with tasks from foundations and framing to flooring and finish work. New construction tasks vary according to the build phase of each particular home, and volunteers help us build year-round, 3 days per week.  Parking varies by site, either on location or nearby streets. Please be courteous to our neighbors! Repair volunteer tasks include exterior work like siding, painting, and deck construction. Recycled or “Buyback” tasks include interior work like replacing flooring and painting, to update homes Habitat originally built for a new family. Repair/Buyback volunteers help us build Spring to Fall, 3-4 days per week. When fastening your safety harness, make sure you hear the click!